South Yorkshire Police have recovered stolen property valued over £3million from criminals who are intent on causing misery to South Yorkshire residents and motorists. Fishing tackle, quad bikes, jewellery, building materials and a lorry carrying a crane are just some of the more unusual items seized by officers since the launch of Operation Lockdown in October 2013. Electrical items, mainly sat navs, car stereos, TVs, mobile phones and games consoles, have also been recovered from burglaries and vehicle crimes, and where possible, returned to their owners. Having valuable or personal items stolen from your home or car is a distressing experience so any property we recover and return to people is good news. We’re doing our utmost to track down criminals and recover stolen items but the public can help us, and more importantly themselves, by registering their property on the Immobilise website. The online database is quick and free to use, and could help individuals to get their items back if they are lost or stolen. We know that people would rather not have anything stolen in the first place but thanks to Immobilise and the action we are taking, life is becoming more difficult for thieves. The Force is deploying ‘sting’ vehicles across the county and officers are working closely with Crimestoppers to maximise intelligence and add to the thousand-plus arrests that have already been made during Operation Lockdown. Between 1 October 2013 and 12 January 2014, police recovered stolen property linked to burglary and vehicle crime in South Yorkshire worth an estimated £3,017,629. 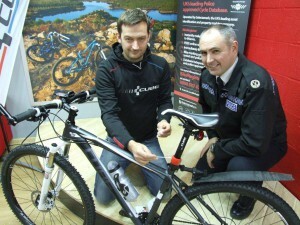 South Yorkshire Police would love to return stolen items to their owners and people can register their valuables free of charge at www.immobilise.com. Further information about home and vehicle security is available in the Help and advice section of the Force’s website. Anyone with information about burglary or vehicle crime should contact South Yorkshire Police on 101, or call Crimestoppers anonymously on 0800 555 111.